In steelmaking, two desirable qualities strength and ductility vary indirectly: Stronger steel is less ductile, and more ductile steel is not as strong. Engineers at Brown University, three Chinese universities, and the Chinese Academy of Sciences have shown that when cylinders of steel are twisted, the steel becomes stronger at the surface with ductility preserved at the core. Steel is one of the rare materials that is both strong and ductile, which is why it's ubiquitous as a structural material. As good as steel is, however, engineers are constantly working to make it better. The problem is that methods of making steel stronger tend to sacrifice ductility and vice versa. "We call it the strength-ductility tradeoff," said Huajian Gao, professor of engineering at Brown and senior author on this new research. He and his colleagues have found a way around that tradeoff in cylinders made with a particular kind of steel called twinning-induced plasticity (TWIP) steel. TWIP steel can be made stronger through what's called work hardening. Work hardening is the process of strengthening steel by deforming it bending it, flattening it, or hammering it on a forge. 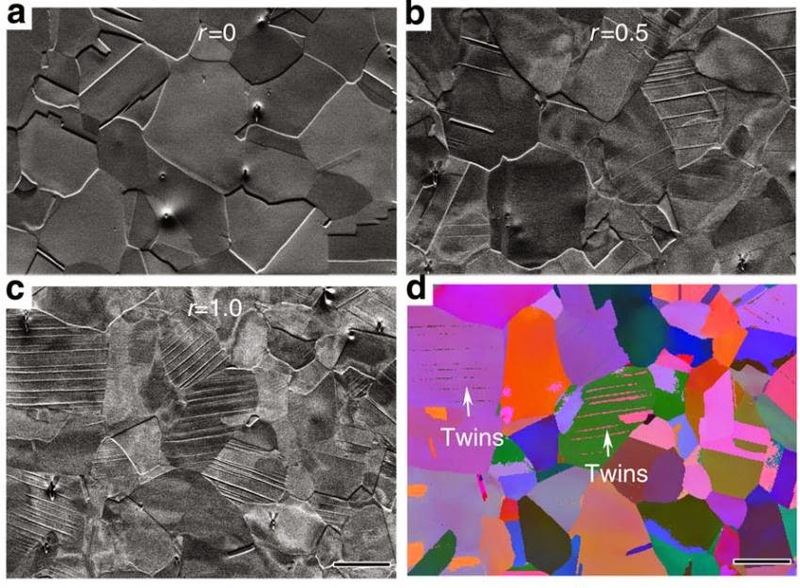 When TWIP steel is deformed, nanoscale structures called deformation twins form in its atomic lattice. Deformation twins are linear boundaries with identical crystalline structures on either side, forming a mirror image across the boundary. Twin structures are known to make TWIP steel much stronger, but just like other ways of hardening steel, there's a ductility tradeoff. To evade that tradeoff, Gao and his colleagues introduced a new twist literally on the deformation process. Instead of deforming the steel by hammering it or bending it, Gao and his colleagues took small cylinders of TWIP steel and twisted them. The twisting motion causes molecules in the outer parts of the cylinder to deform to a much greater degree than molecules toward the core. The idea is a little like runners on a track. Those running in the outside lanes have more ground to cover than runners on the inside. The result is a steel cylinder with the best of both worlds the surface of the cylinder becomes stronger and more resistant to cracking, while the inside retains its original ductility. "Essentially we partitioned the material into a hardened part near the surface and a softer part near the core," Gao said. "This allowed us to double the strength without sacrificing ductility." The work in the lab was done with very small cylinders on the order of centimeters long. However, nothing indicates that the process can't be scaled up to larger cylinders, Gao said. Eventually, Gao and his colleague hope their technique could be used to pre-treat steel that requires a cylindrical shape axles or drive shafts on cars for example. In particular, Gao sees torsioned steel as a good option for axles on high-speed trains. "It's critical to have high strength and high ductility for such an axle component," Gao said. "So it's critical in this kind of system to push this strength-ductility limit as far as possible." Gao's coauthors on the paper were Yujie Wei (lead author and a former postdoctoral fellow at Brown), Yongqiang Li, Lianchun Zhu, Yao Liu, and Xianqi Lei of the Laboratory of Nonlinear Mechanics, Institute of Mechanics, Chinese Academy of Sciences; Gang Wang of Laboratory for Microstructures, Shanghai University; Yanxin Wu and Zhenli Mi of the University of Science and Technology, Beijing; and Jiabin Liu and Hongtao Wang of Zhejiang University.